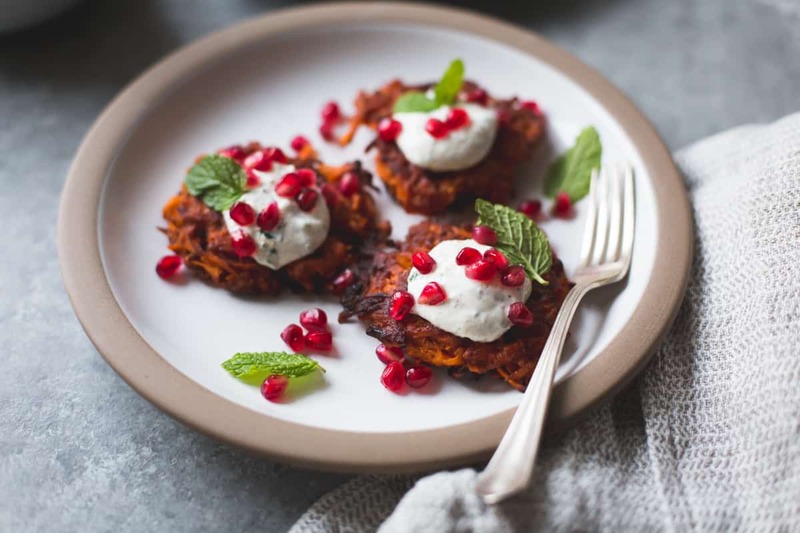 Crispy sweet potato cakes get a kick from spicy harissa, chickpea flour, cumin-mint yogurt sauce, and pomegranate. It’s a bit absurd that in 6+ years of Bojon, this is the first latke recipe to date. But I have a great excuse: I was scared. Each year at Chanukah, my brother makes latkes. Our family isn’t huge – there are maybe 10 or 12 of us at dinner – but the latke-making takes forever. He gets two skillets going, grates approximately 10,000 potatoes, then stands before the vat of potato goop frying potato cakes until the whole house smells like hot oil and spuds. He’s done this for as long as I can remember. The latke honeymoon must have been over years ago, because it is with a great ennui and much beer that my brother makes his latkes, handing off plates to the kids while the rest of us stand by, anxiously awaiting our turn to nom crispy potato cakes glooped with apple sauce and sour cream. My brother got a reprieve one year when my sister broke with tradition and hosted Chanukah at her home in Marin and my brother bowed out of latke duty. I optimistically volunteered to take over with the help of Jay and a friend from out of town. We did everything wrong – wrong oil, wrong recipe, wrong heat. After several batches of charred/raw potato cakes, my brother swooped in to wipe the pans free of burnt crumbs and replace the singed oil with clean peanut oil and his latke skillz, and Chanukah was saved. With all of this to-do about latkes, I hesitated to give them a go at home, though this fear was largely unconscious. I’d think, “Mm, latkes! Maybe I’ll make some?” Then I would immediately do something else instead. I was unaware of my psychological latke block until the other night when I finally braved the potato cakes once and for all. Sweet potatoes seemed less intimidating somehow, and I wagered they’d pair well with my minty spiced yogurt. I stirred up a bowl of latke goop, essentially just shredded potatoes mixed with flour, salt, onion and egg (plus a bit of extra flavorings). I heated up some oil in a couple of skillets, and used a spring-loaded scoop to drop mounds of batter into the hot oil. I figured I’d be frying over a hot stove for ages, moaning and turning to drink for comfort. And so, I was surprised when I made it to the bottom of the batter bowl in a matter of minutes. It was then that it hit me: latkes are EASY. Especially when you’re only making them for a few people, or better yet, for yourself plus leftovers. I would even go so far as to call this an easy weeknight meal, no more difficult than making regular pancakes or any other vegetable fritter, both of which I’ve been doing for years. Chickpea flour adds a bit of nutty flavor and protein while keeping these naturally gluten-free. Sweet potatoes, harissa and smoked paprika pair well with thick skyr or greek yogurt threaded with slivered mint, toasted cumin and plenty of garlic. Pomegranate arils add pop and crunch. The result? 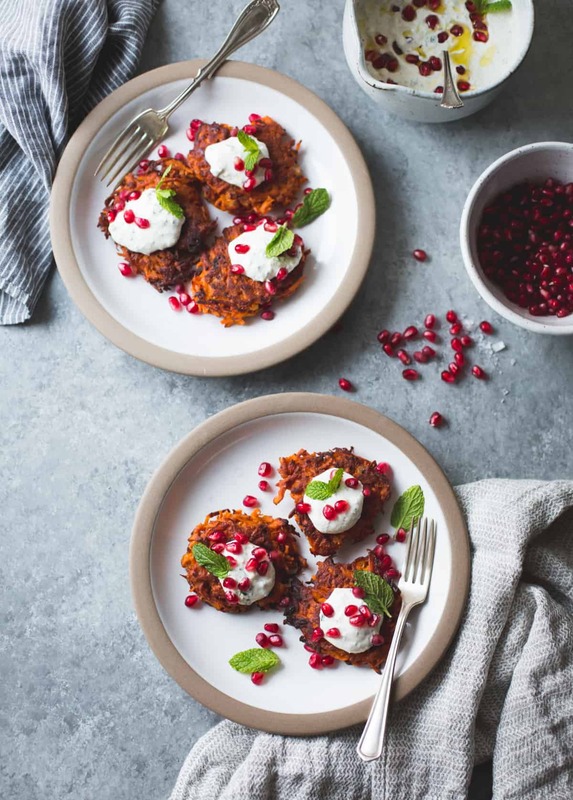 Sweet potato cakes that are crispy on the outside, soft on the inside, a little smoky, a little spicy, all doused in a cooling sauce and prettied up with pomegranate. 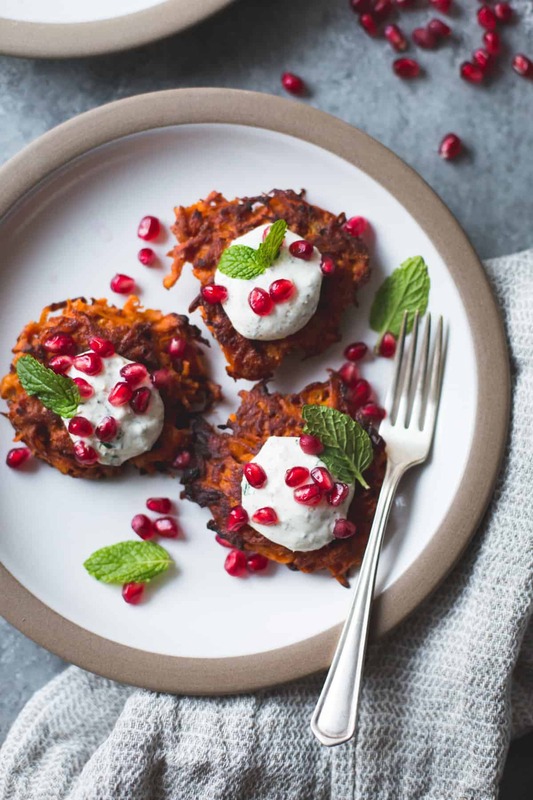 A spicy-sweet take on Jewish potato pancakes, these are kissed with harissa, chickpea flour, and smoked paprika and topped with a zippy yogurt sauce and pomegranate arils for crunch and color. Peel the sweet potatoes and grate them on the large holes of a box grater or with the grater attachment to a food processor. You should have about 4 cups. 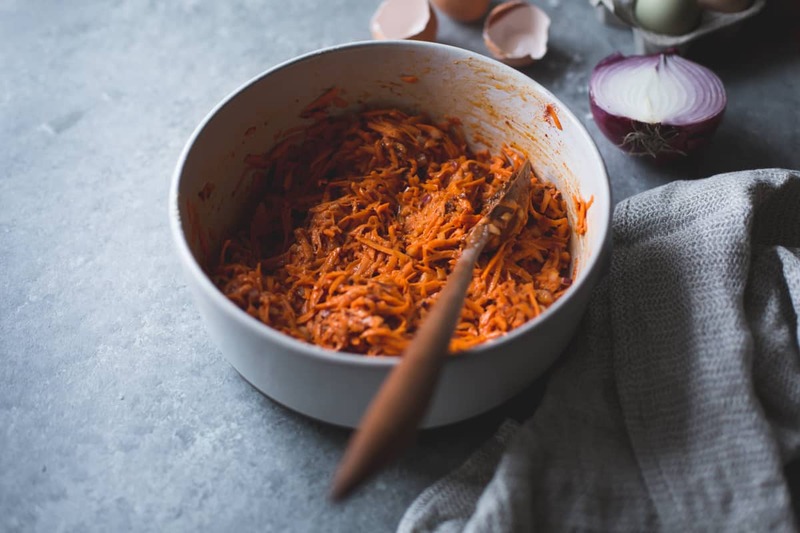 Place the grated sweet potato in a large bowl and add the onion, sifted chickpea flour, cornstarch, eggs, harissa, paprika, salt, and pepper. Stir well until combined (the harissa will want to clump, so make sure it gets evenly distributed throughout the batter). Heat a film of oil in a wide skillet set over medium heat until it shimmers. Drop 1/4 cup scoops of batter into the hot oil, flattening slightly (a spring-loaded ice cream scoop works well). Fry until deeply golden on the first side, 2-3 minutes, then flip and cook on the second side until golden and cooked through, 2-3 more minutes. The heat should be low enough that the latkes cook through by the time they're golden on the outside. Remove the cakes to a cooling rack lined with paper towels; this will drain the cakes while helping them stay crisp. (If making these for a crowd, you can place the cooling racks on baking sheets and place in a 250ºF oven to keep warm.) Repeat with the remaining batter, adding oil to the pan as needed. 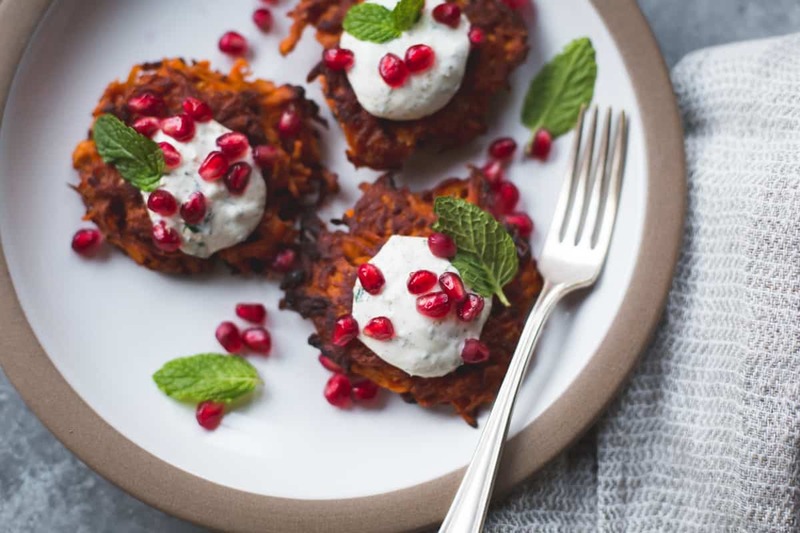 Place the latkes on plates and top with spoonfuls of yogurt sauce, a sprinkle of pomegranate arils and a few mint leaves. Serve immediately. The latkes are best when fresh out of the pan, but they can be reheated in a hot skillet until crispy and heated through. Extras will keep, refrigerated airtight, for up to a day or two. Harissa, a type of red chile paste, can be found in well-stocked grocers along with other Middle Eastern foods, and it makes a great addition to this tabbouleh, this roasted vegetable salad, and these squash cakes as well as stirred into scrambled eggs, spread on grilled cheese sandwiches, or swirled into soups. Since harissas vary in spiciness, taste yours before adding. For extra spicy latkes, add another tablespoon of harissa to the batter. i was going to be like, are you on a yogurt/mint/pomegranate kick? (; but this sounds like such a great pairing with the yogurt dip! dishes with tons of contrast (crispy latke with creamy dip, hot and cold, spicy and cooling) are my favorites, and this one definitely sounds like it’d fit the bill. Haha, well yes, yes I am. ;) You totally hit in on the head with those contrasts! These look so good! I have a special appreciation for these because my adopted sisters are from Ukraine where latkes are a very traditional item. 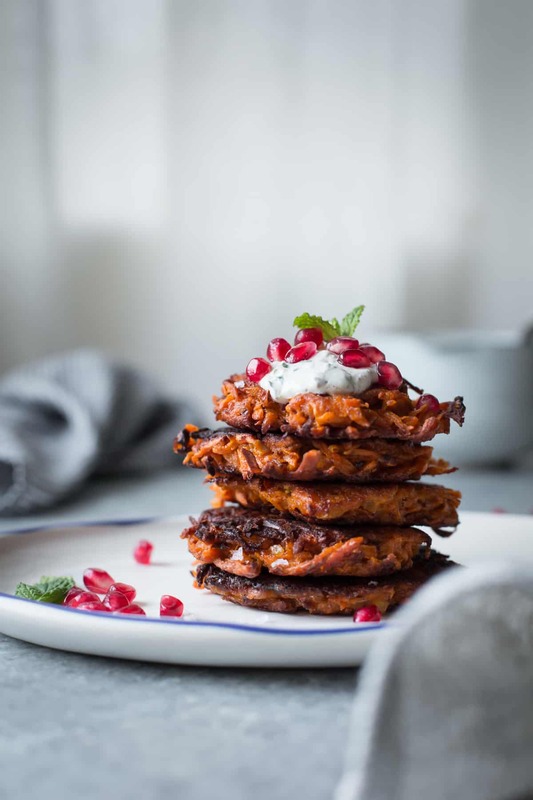 I bet I’d love sweet potato ones even more and I love that you topped them with pomegranates! These latkes. Obsessed. 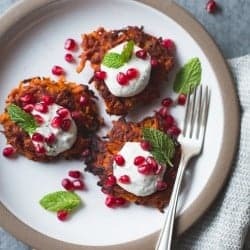 I have my own (purple) sweet potato latke plans this year, but am going to need a second whole night of latke making to whip up these babies. They may very well be my platonic latke ideal, and for that, I bow in latke gratitude. 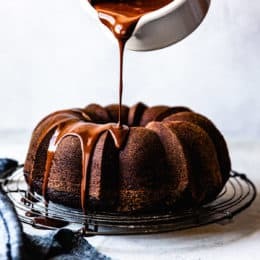 This looks so good and since I’m kind of obsessed with anything sweet potatoes, I’ll have to make it one of these days, the sooner, the better! I’ll just do it without chili because I’m allergic. Love the photos, the light is just wow! As I’m slowly making the transition to gluten-free eating this year (and my whole body is thanking me for it! ), these latkes will come in handy as the year’s latkextravaganza hits. 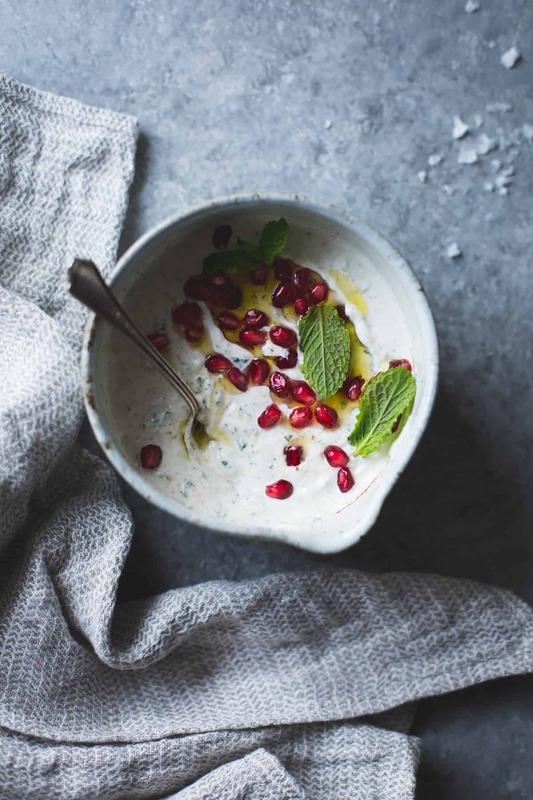 I love the pairing of harissa with pomegranate! Perfection. Happy Hanukkah!!! Aw, so glad the GF thing is helping you out – yay for that. Happy Hanukkah to you, too! There are certain foods that I have built up in my head as too challenging to make too (my mother used to make these Dutch donuts every NYE and as much as I crave them, I am terrified of using a fryer), but isn’t it the best when those scary foods turn out to be a cinch? Latkes always seemed hard to me too actually! Once as a teenager I attempted to make them and it was all burnt on the bottom/raw in the middle – not good. The sweet potatoes and harissa combination sounds amazing. 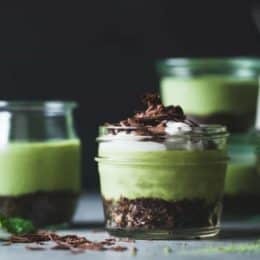 I’m really loving the idea of making these to go with your lovely yogurt dip from yesterday, as you suggest. Yum! My sister makes latkes like a boss. The first time she was at my house when I was making them for my family she said WHO taught you to make latkes LIKE THAT? and it wasn’t because she thought they were going to turn out well. So, I hear you. It’s a fraught pancake. Going to make these very enticing latkes of liberation you suggest and see what magical changes take shape! Bahahaha! Your sister should meet my brother! Heehee. I’ll cross my fingers for you. Latkes are often unthought of, but are one of the most awesome dishes out there. I love your take on the traditional!! Thanks, Sarah! I used to only think of them for Chanukah, but now I want to eat them everyday forever. This looks like something healthy and delicious at the same time. I’m going to give it a try. Thanks for the recipe. I made yesterday a jar of harissa for the project you know…I should try some vegan-interpretation of these latkes! Ooooh, perfect! I want to make your harissa! 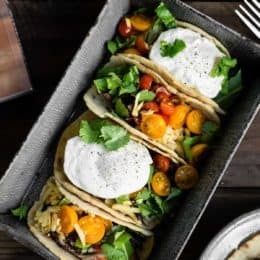 YUM, I’m making these for dinner tonight. Great post too, your food humor and candor is always spot on! I have always wanted to try making latkes. These look so tasty! I think I speak for everyone when I say that I’m glad you conquered your fear of making latkes because these look absolutely delicious! 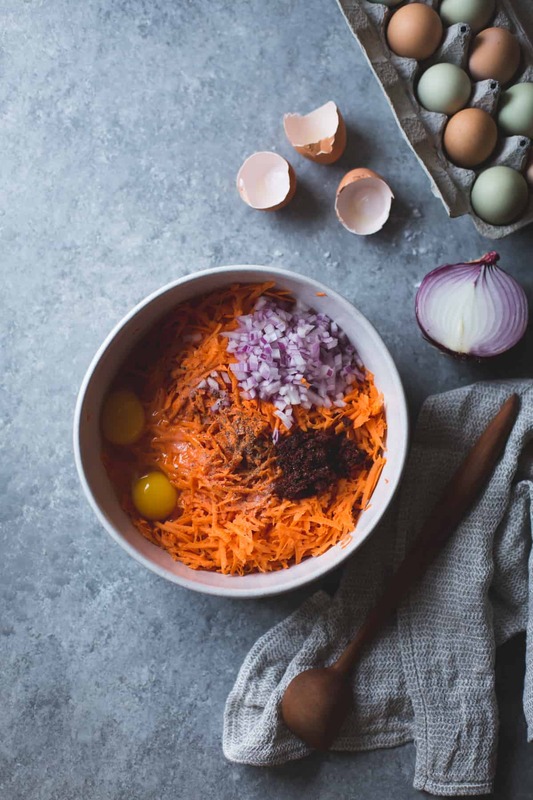 You also make latke making look fun & easy:) These photos are just simply stunning, Alanna! I love how crisp and sharp the mint leaves look with the softness of the background. And the food looks pretty tasty too (why didn’t you bring those for lunch today??). Lovely! And congrats on the NYT stuff. Might even try some of these Hawaiian purple sweet potatoes I picked up at the market. Amazing! True art gourmet! Thanks for sharing.